The Crappy Tala-Kangundo Road | Hujambo! The Tala-Kangundo highway from Nairobi is terrible. It seems as if the road is in a constant state of decline. I find myself often commenting to strangers, “Hii bara bara ni mbaya sana” (“this road is very bad”), it’s a great ice breaker. We laugh and speculate about whether someone will tengeneza (“repair”) it any time soon, and then my Swahili vocabulary is just about extinguished. Side note: it’s hard to be funny when using a language which you have only mastered up to the level of the local toddler. Certain sections of the road are worse than others. One spot in particular, between Kantafu and Koma Hill, is pretty consistently hideous. I was returning to Tala today and noticed a throng of young men with shovels crowding around one of the rough areas just before Koma Hill. As we got closer I saw them start jumping and shouting. I heard the driver yell something about kumi (“ten”) to the conductor, who then stuck his head out the window, presumably to toss the boys a ten shilling coin (ten shillings can buy a cup of tea, and for reference, we pay 100-150 shillings fare from Nairobi to Tala). The driver then commented, “Wamefanya vizuri” (“they’ve done it well”). It’s true, the pot holes had been filled in with sand and rocks and leveled out, making that section much more pleasant, at least for a little while. The pay is far from flattering, but those dudes on the road side are entrepreneurs; they alone are responsible for the few “repairs” I’ve ever seen made to that road in the two years I’ve lived in Tala. It’s kinda ridiculous that those youths scooping sand and rocks from the road side constitutes road repair. I’ve never seen any official work being done on that road. I guess it’s not so bad compared to other major roads I’ve traveled in Kenya, though. Western Kenya, terrible. 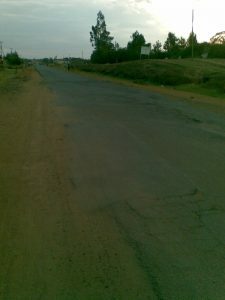 Kajiado-Namanga, terrible. Kangundo-Machakos, terrible. Tala-Thika, terrible. Northern Kenya, what road? I always wonder, “It’s not like Kenya is poor, why doesn’t the government fix these roads?” There is a lot of money in Kenya but it’s apparently in the hands of the wrong people (the government, ironically. See my post on the Kings of Kenya). Also ironic, the roads in Central province are pretty sweet. President Kibaki comes from there… coincidence or conspiracy? i think the road is terrible and needs attention. True da road is terrible and somethn nids to be done. Ever been to Central Province? He left a mark in Kangundo! unfortunately no one cares how this roads can be maintained….Anyone reading this?.. Any plans in place for expansion & repair? i don’t know..is the answer. we rather be part of solution.